My wife and I just returned from a trip to Washington state. We visited lots of beautiful places, which have given me plenty of ideas for blog posts! I couldn't decide which was the best, the wildflowers of Mt. Rainier or the tide pools of Rialto Beach. 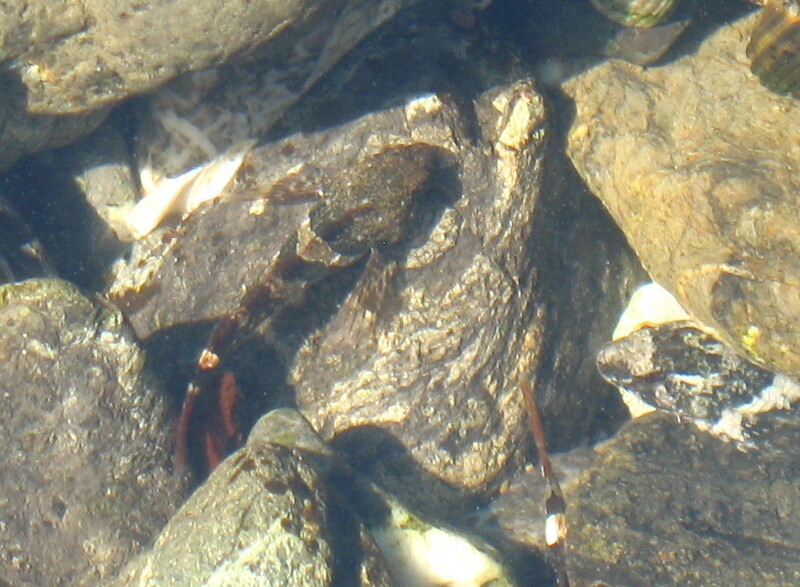 I flipped a coin and Rialto won, so presented for your enjoyment are some of the creatures lurking in its tide pools. So the color of each sea star may be determined by what it prefers to eat. Check out this interesting article for more details. 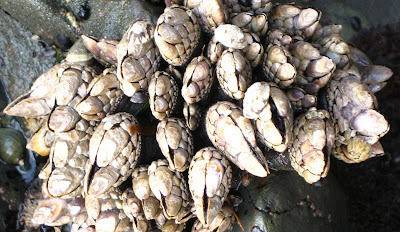 Here is a cool close-up of some Thatched Barnacles. I believe the green part is algae. Here are some Whelks at a barnacle buffet. You can see the empty shells of the ones they have already eaten. Let's finish with some prettier creatures. These are two types of anemone, a Giant Green Anemone (guess which one that is) and an Aggregating Anemone (that's the other one). 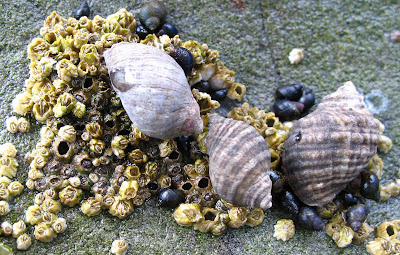 The Giant Green is pulling a mussel from its shell. The pink stuff across the top is Coralline Algae, with three Limpets munching on it. In the bottom left is some Red Algae. Fantastic day at the beach! 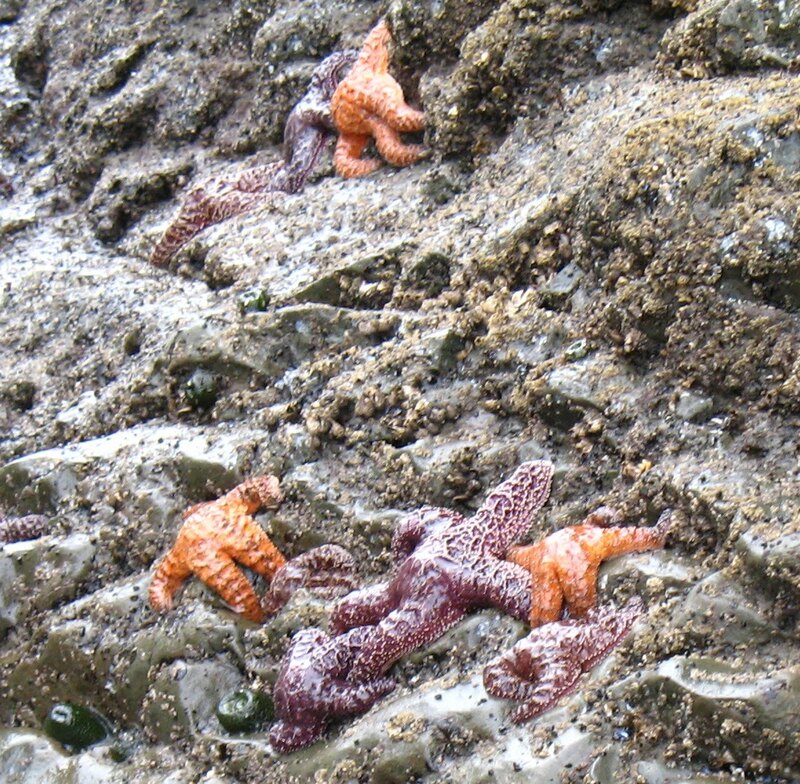 Those starfish are so cool - I've never seen a live one. The color differences remind me of hydrangea blooms, and how the bloom color is determined by the pH of the soil. I wonder if barnacles and mussels have notably different pH body chemistry? @Kevin - thanks for the link. I think that is the article referred to by the blogger I linked to above, although I don't have the entire article. @Amber - could be the pH, nobody knows for sure. 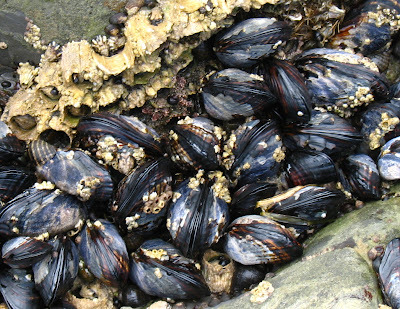 One theory I saw was that the "base" color was purple, and the orange was caused by carotenoid pigments in the mussels. Thank you for this most interesting post! I've lived in Washington state for 40 years now, and sailed all around Puget Sound. 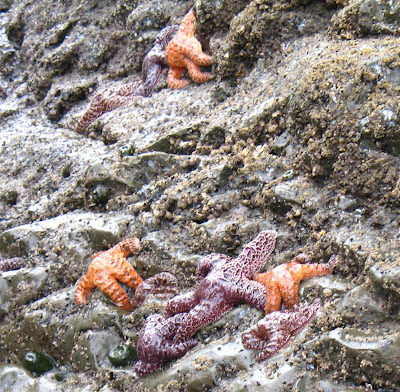 Never have made it out to La Push; the colors of the critters are just gorgeous! Add to that the attitude of Americans toward those suffering mental health issues wouldn't be tolerated toward other illnesses: cancer, tuberculosis, heart disease, physical infirmities of any kind. Imagine hating or humiliating those suffering from any of the other illnesses above like people do toward those who are mentally ill. Adam Lanza is universally hated. It's always a pleasure to come here and nice to be with other like minded people. When Rossi came it was fantastic. The crowd was massive and the following for him was spectacular. However, we know that degrees in relevant subjects that can be use to explain trends of our minds, finances, and sciences will be more useful. I will take a student with basketball shirts a BS in neuroscience or BS in microbiology over anyone with a BA in english. Why? Because the abilities of a person getting an English degree is custom polo shirts innate to those with science degrees. This book is the sequel to The Cronian Incident, which was published last year (and was a little shamelessly promoted at the time). By definition, hard sci fi refers to stories where scientific accuracy is emphasized. We have a fantastic roundup today so now, on to this week worth of stories!Posted on July 4, 2018July 5, 2018. Aunt Millie, So if you are walking in your community and some guy angrily approaches you and asks what you are doing you will answer, you will submit, you show deference, you acquiesce, you do not stand your ground? America land of the free and any whack with an inferiority complex can demand of anyone and start drawing lines in mexican shirt the ground. And if they do not submit they will be shot. Land of the free? Sort of like the freedom they were working on in mardi gras shirts Germany circa 1933 to 1945.